The post-Byzantine church of Ayia Marina is located in the 75th km of the Old National Road going from Thessaloniki to Kavala. It is built just a few kilometers away from Asprovalta and Nea Vrasna, in the valley of the Macedonian Tempi. Once the traveler faces the Byzantine dome which is covered with slate, he feels the need to stop for pilgrimage. 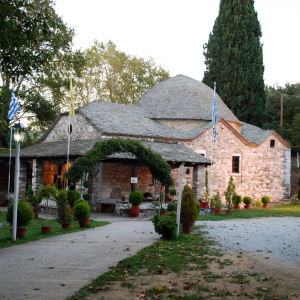 Legend says that the Modi village priest, Themelis, who had a vineyard close to the spot where the church is today, was visited by Agia Marina in his dream. She commended him to remove her icon from the hollow trunk of a tree and to place it in the church that he would then build in ther name. The priest was a real person also with descendants in the village that bear his name as their surname. Another (similar) version is the one told by some that the image found in a hollow elm that a Turkish provost cut down. A Modiotis helped him with his carriage to carry the wood to Vrasna and the Turk gave him the icon and allowed him to build the church. The architecture is one-aisled basilica with dome.